Aachen (Germany) based StreetScooter GmbH designs, develops and produces e-vehicles for short distance travelling within urban environments. 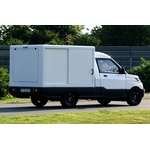 The range of models covers e-bikes, small passenger cars as well as commercial vehicles. Currently, StreetScooter focuses on e-vehicles for last mile logistic operations.